The foundation of the Technical University dates back to 1837 (in fact, to 1836 according to the calendar which was in effect at that time), which is just few years after the foundation of the modern Greek State. At that time, the "Royal School of Arts" was founded in the most elementary form of educational institution, as a municipal school of technical education. The "School", in its initial form, operated only on Sundays and bank holidays. It offered courses for technicians (workmen, head workmen, builders). Soon it became known as "Polytechnion". During the first years of the modern Greek state there were no established methods for the education of engineers or even craftsmen. Thus, the foundation of the first faculty of technical education was a decisive step towards the formation of the technical and technological future of the country. The number of prospective students was so great, despite the remote location of the region, so that in spring 1840 a school of continuous (daily) operation was also added to the Sunday school. The courses were extended and their number increased. Then "Polytechnion" was established in an independent building in Piraeus road. The zeal of students and teachers helped the school develop and rise to its modern level. School of Sundays and bank-holidays. School superior, for daily teaching of "Beaux Arts". Then was then named "Faculty of Industrial and Beaux Arts" ("School of Beaux and Brutal Arts"). With the word "arts" they referred to both professions and beaux arts. This formed the roots of a tradition that survives up to the modern days. Indeed, the current National Technical University of Athens includes, among others, a school of Architecture and maintains close relations with the School of Beaux Arts, which in the meantime, became an independent Institution. A second rearrangement took place between 1862 and 1864. Polytechnion was reorganized and expanded with the addition of more technical courses. This tendency was continued in the period starting in 1864 and ending in 1873. The Faculty was located in what – at that time – was considered the outskirts of the capital. Its growth and development into an Institution for University Education, was closely interwoven to the increasing need for training Engineers and technicians in general. However the capacity of these buildings was soon too small to properly serve the educational aims of the "School". For this reason, in 1873 the school finally moved to a group of buildings in the center of the capital, the buildings of Patision avenue and was named "National Technical University of Athens" (abbreviated – N.T.U.A.). In Greek, N.T.U.A. is called the "Ethnicon Metsovion Polytechnion" which stands for National Metsovion Polytechnic. It was named "Metsovion" to honor the donors and benefactors Nikolaos Stournaris, Eleni Tositsa, Michail Tositsas and Georgios Averof, all originally from Metsovo, a small picturesque town in the region of Epirus, who made substantial donations in the last half of the 19th century. In 1887 Metsovion Polytechnion was divided and the faculties of technical expertise fell under the School of Industrial Arts. Three faculties of four year study were founded. The School of Arts is promoted into a University Institution for Structural Engineers, Architects and Mechanical Engineers. From then, the growth and development of the institution began – a kind of growth that has kept pace ever since with the technical and economic progress of the country. The operation of Faculties is continued until 1914, when the Institution came under the authority of the Ministry of Public Work and established finally as National Technical University of Athens (N.T.U.A.). At the same time it was extended and new faculties of Engineers were created. The last radical reform in the organization and administration of Institution, before the Law 1268/82 which reformed University Education in Greece, took place in 1917 with a special law that gave the N.T.U.A. his current form, including the University Faculties of Civil Engineers, Mechanical and Electrical Engineers, Chemical Engineers, Topographers and Architects, instead of the School of Industrial Arts, which was abolished. Up until 1950, N.T.U.A. was the single educational institution in Greece, authorised to educate engineers. That time it became an Institution of Higher Education and the first technological educational institution of the country. The Institution gradually included in its curriculum the education of Civil Engineers, Mechanical engineers, Electrical Engineers, Agronomists and Topographers Engineers, Chemical Engineers, Architects Engineers, Engineers of Mines and Metallurgists, as well as Naval Mechanical Engineers. The N.T.U.A. operates under the state supervision, wielded by the Minister of the National Education and Religious Affairs. In the School of Mechanical and Electrical Engineers courses are continuously added and new laboratories are created. The "Electric Laboratory", created in 1911, aimed at the control of electricity and gas standards. At the same time, exercises and experimental training were carried out for the students of Faculty. Then, the Laboratory was enriched with machines and instruments and it acquired a more special electrical character: this constituted the basic laboratory from which all the later electrical laboratories sprang. These laboratories are: Electrotechnical, Electric Machines, High Voltage and Electric Measurements, Systems of Electric Energy, Radio and Communication of Long Distances, Electronics and Telecommunications Systems. The courses offered by the Faculty of Mechanical and Electrical Engineers were mixed and were all mandatory. During the 1960’s the need to segregate the two sections began to emerge. The constant technological progress rendered necessary their segregation that took place in 1975. The Faculty of Electrical Engineers in order to meet the technological developments had created two terms of study: the Electronic and the Energy Engineer. 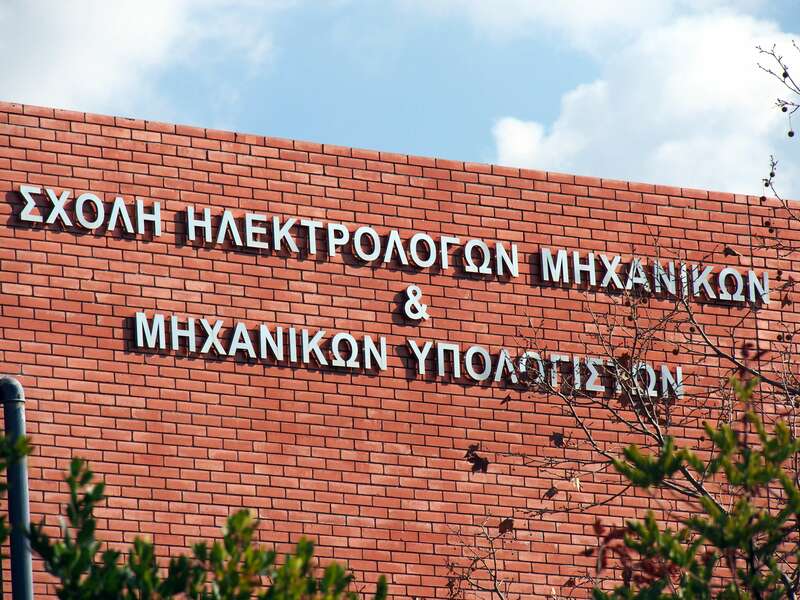 With the application of law governing higher education in Greece, in 1982, the Faculty of Electrical Engineering was renamed to "Department of Electrical Engineering" with three sectors: Electroscience, Electric Power and Information Technology. Since 1984, the sectors of study became four, after the addition of Engineering of Computers and Information Technology. After the presidential decree that was published in May 1991, the Department of Electrical Engineers was renamed to "School of Electrical and Computer Engineers". With this legislative act the field of Computer Engineers and Information technology, which the Department has been dealing with for years, was formally recognized. The existing laboratories have been completely modernised, while new laboratories were also established. All the laboratories are connected via a network that allows their full utilisation.